"There is hope – even though there are aquatic invasive species present in some of our local lakes. In the last five years, counties have received state aid to support local efforts to stop the spread. Watercraft Inspection / Education takes place at many public water accesses during the summer months. Decontamination units clean boats and equipment. Radio, TV and newspaper ads are presented to inform the public of the AIS spread and give direction on how to be a responsible boater. Along with prevention and control, we must also focus on the research component. The Minnesota Aquatic Invasive Species Research Center (MAISRC) works across the state to develop research-based solutions that can reduce the impacts of aquatic invasive species in Minnesota by preventing spread, controlling populations, and managing ecosystems; and to advance knowledge to inspire action by others. The Center opened in 2012, and according to Director, Dr. Nicholas Phelps, “The state of Minnesota took a leadership role in the fight against AIS and created an interdisciplinary, innovative and forward-thinking Center to develop much-needed science to solve our AIS problems. We knew that this type of research would not be easy or fast, and expectations were high. 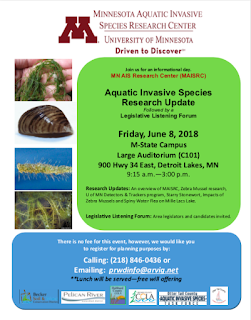 However, after only five years, I am proud to report that the Minnesota Aquatic Invasive Species Research Center has made significant progress towards our goals--solutions are within reach.” To learn more about findings and current research, go to their page at www.maisrc.umn.edu. Dr. Nicholas Phelps, Director of the Minnesota Aquatic Invasive Species Research Center. Phelps will discuss the first-of-its-kind decision-making tool he is creating that will help AIS managers, counties, and other agencies prioritize their resources for optimal prevention and intervention of AIS, specifically zebra mussels and starry stonewort. 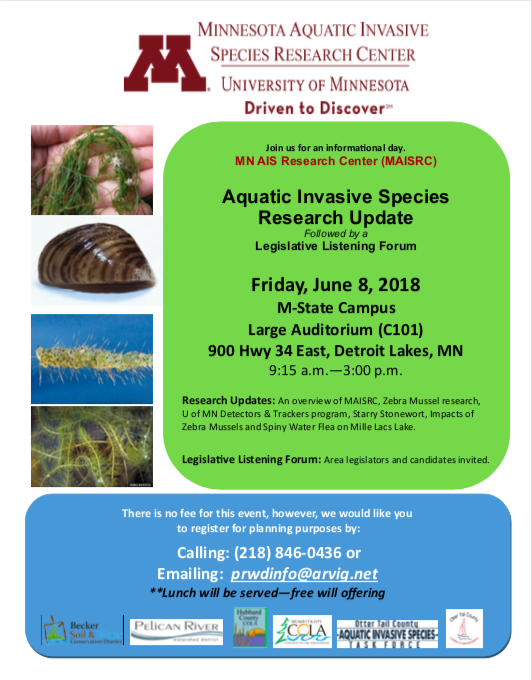 Phelps will also provide an overview of the Minnesota Aquatic Invasive Species Research Center and its projects. Dr. Michael McCartney, Research Assistant Professor. McCartney will explain how he used population genomics to understand the spread of zebra mussel across the state and how that can be used to prevent future spread. Megan Weber, Extension Educator. Weber will provide an overview of MAISRC’s signature outreach programs, AIS Detectors and AIS Trackers. AIS Detectors is now in its second year, and AIS Trackers is currently being piloted. Weber will include how lake managers, agency staff, and others can benefit from these highly trained citizen scientists. Dr. Ranjan Muthukrishnan, Postdoctoral Research Associate. Muthukrishnan will discuss his research on invasive algae starry stonewort, including how modeling can assess the risk of sprad and improve prevention efforts. Bethany Bethke, Fisheries Research Biologist. Bethke, who is employed by the Minnesota DNR but partnering MAISRC on groundbreaking study, will discuss how they are using stable isotope analysis to understand the impacts that spiny waterflea and zebra mussels are having on Minnesota’s ten largest walleye-producing lakes, and what it means for the future of walleye in Minnesota. A legislative listening forum is also being coordinated to complete the day. Local legislators and candidates have been invited to hear from Individuals from various walks of life the need to keep funding in place for researchers to continue their important work. There is no fee for this event. Lunch provided - free will offering. Bring a friend or two to share in this learning experience. Please register at (218) 846-0436 or email prwdinfo@arvig.net."